This summer, biologist Mimi Kessler ’01 became one of the first women to see a snow leopard in the Altai Mountains of southern Siberia. There are believed to be only 30 or 40 snow leopards in the region and only 20 people have reported seeing one before, all of them men. Kessler is a doctoral candidate at Arizona State University who traveled to Siberia this summer to participate in a wildlife expedition sponsored by conservation organization the Altai Project. The team was hiking in a mountain range in the Altai Republic of Russia, within a kilometer of the Mongolian border. According to an Arizona State University press release, Kessler and three other expedition members were taking a water break when she noticed something unusual. "Snow leopards are held sacred by the Altaian people because they live out their lives on mountain peaks, communing with spirits in the heavens,” explained Jennifer Castner, director of the Altai Project and fellow Seven Sisters alumna (Bryn Mawr). There are estimated to be only 90 snow leopards in Russia. 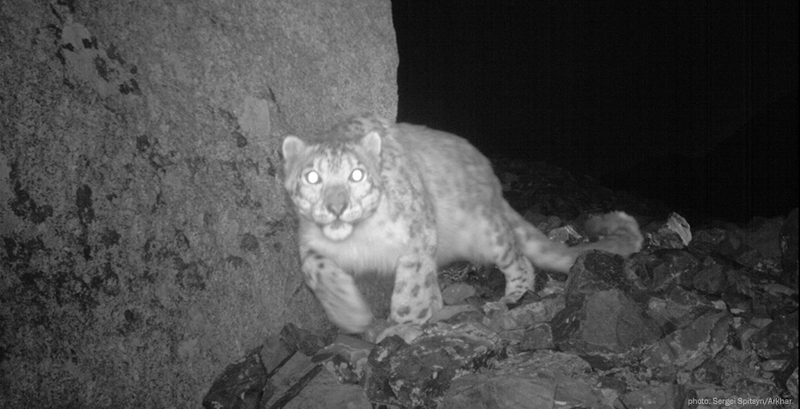 “My biologist colleague has studied snow leopards there for 30 years and never seen one with his own eyes. I was humbled and honored by the snow leopard's presence that day." Mimi Kessler’s interest in Central Asian wildlife first took root during her Wellesley years. Majoring in both Russian area studies and environmental studies, she studied abroad in Uzbekistan in 1999 and in 2001 was a member of the first Wellesley group to study Lake Baikal. After graduating, Kessler received a Susan Rappaport Knafel '52 Traveling Fellowship to explore the region she had come to love. “I’m extremely grateful for the experiences that fellowship afforded me—by spending the money frugally I was able to spend two years learning about the environment, cultures, history, and languages of Central Asia,” she said. Kessler speaks or understands Russian, Uzbek, Mongolian, Kazakh, Kalmyk, Spanish, and some Altai.